Can scientists engineer a biofuel that will replace the environmental and climate destroying and evermore expensive fossil fuels central to the functioning of our urbanized civilization? The answer is no and yes. Green crude: Harvesting oil produced by algae at Sapphire Energy’s Green Crude Farm in Columbus, New Mexico. No, we will never replace the monopoly in production, fuel delivery, and universal transportation dependence-addiction that is oil. Meaning the solutions to the coming shortage of easily-obtained petroleum and the resulting spiral in prices will necessitate a wholesale reconsideration of how we get from here to there. We must retrofit our cities with mass transit, complete walkable and bikeable streets, and more compact neighborhoods in proximity to shopping or work. California presently is in this process on a regional level with Sustainable Community and Transportation Plans recently approved in Los Angeles-Metropolitan Southern California and San Diego. While many European and Asian countries are adopting visions for future sustainability, carbon dioxide levels continue to climb and the global climate appears more unstable with each successive hurricane, tornado, flood, drought, wildfire, and melting of the polar ice caps. Urban rethinking would include regulating greenhouse gas (carbon dioxide) emissions from vehicles and increase fuel economy standards. We should also develop low carbon fuel standards that would limit the use of such dirty oil sources such as the tar sands of Alberta. According to the Union of Concerned Scientists, we must move toward an 80 percent drop from 2005 CO2 levels by 2050 to avoid the massive climate destabilization and environmental and social effects from anthropocentric greenhouse gas-induced global warming. We should implement a program for deployment of zero-emission Advanced Vehicle Technology, including carbon-fiber composite plug-in electrics, hydrogen fuel cells, and natural gas hybrids, and of course, biofuels. Yet, not all biofuels are the same. I drive my wagon on biodiesel made from carbon-neutral, low-emission, recycled vegetable oil distributed by the Biodiesel Coop of Los Angeles. Additionally, All Nippon Airways(ANA) recently completed the first cooking-oil-blend trans-Pacific flight. Used cooking oil processed into biodiesel, though an encouraging, small-scale, sustainable alternative, would not one day become a large-scale viable alternative to fossil fuels. Hence, we will start our macro-analysis with the first generation alternatives, called Agrofuels, derived from intensive industrial monocultures, often covering thousands of hectares, most often in the Global South. Institutionally-Supported Industrial Monocrop Supercedes Peasant Agriculture. The search for alternatives to fossil fuels has created a land boom in Latin American-African- and Southeast Asian-produced agrofuels. Sugarcane and corn ethanol and soy and palm oil biodiesel have significant drawbacks in energy balance, food security, hunger and human rights, as well as dubious climate change mitigation. However, the compelling economic frisson between agribusiness (ADM-Cargill-Bunge), biotech, automobile, and oil interests has accelerated an institutional push toward monocrop plantations supported by international investment capital. Considering its fossil-fuel alternative fuel cache with theoretical climate change benefits, we risk turning the Global South into an large-scale plantation to feed the energy hunger of the industrial north. Hence, the Inter-American Development Bank (IADB) has approved $3 billion in loans and guarantees, backed by Structural Adjustment Policies imposed by the International Monetary Fund that advantage large-scale monocrop plantations over small scale, subsistence-based peasant agriculture. World Trade Organization rules and World Bank Group funding mechanisms, enforcing low environmental and labor standards, will ensure the industrial agrofuels will supercede diverse, ecosystem-based agriculture, overruling their rural social organizations. Agrofuel Climate Implications. Agrofuel Production has the potential to increase greenhouse gas levels 17 to 420 times that of the fossil fuels they would replace. Emission come from soils, carbon sink destruction and fossil fuel inputs, which result in deforestation and loss of biodiversity. the clearance of Indonesia’s peat forest to plant oil palm plantations has increased CO2 levels markedly. Forest ecology may reach a reduction tipping point with dangerous climate implications, as in the destruction of the Amazon rainforest. Though carbon emissions trading markets, created as an element in the 1997 Kyoto Protocol, establish payoffs from polluters, called carbon offsets, which can be used to preserve land areas from deforestation. However, the move toward funding agrofuel projects as a Clean Development Mechanism has been based on faulty assumptions of environmental impacts. Genetically-Modified Organisms and Second-Generation Agrofuels. The use of Genetically-Modified Organisms (GMOs) for agrofuels, especially in corn and soy, will gain a dangerous acceptance with biofuels. As well, the biotech industry seeks ways to genetically engineer organisms that will break down fuel crops easier. Promises of future “Second Generation Biofuel” technologies that would yield cheap and abundant cellulosic agrofuels from all plant material and “waste” biomass from “marginal” lands would necessitate significant synthetic microorganisms. Biorefineries would break down the materials with these GMOs, risking contamination of ecosystems as well as impacting those living on the marginal lands. Often, one person’s marginal is another’s survival mechanism. Agrofuels and Biodiversity. As taxpayer monies are invested in agrofuels worldwide, wetlands are destroyed, small farmers and their food production displaced, often to cut forests. Small farms with high diversity of crops creates a better ecosystem for wildlife, while industrial monocrops require significant petrofertilizers, herbicides and pesticides. Massive irrigation is also necessary, depleting and contaminating water sources. African palm plantations have accelerated logging in Cameroon, Indonesia, Malaysia, Ecuador and Colombia. Jatropha tree planting for agrodiesel has threatened remaining forests in Africa and India. Sugarcane and soy have had major ecosystem impacts in Argentina, Paraguay, Bolivia and Brazil. In Guatemala, the Polochic River was re-routed with no environmental oversight to support a massive sugarcane plantation called Chabil Utzaj, which later in 2011 moved to evict thousands of Maya Q’eqchi from 14 communities as part of their land assemblage and job creation project, partially funded by the IDB. Agrofuels and Food Security and Land Conflicts. In 2007 the state of São Paulo, Brazil saw sugar cane plantations increase by more than 300,000 hectares, as land available for food crops shrank by around 170,000 hectares. Land and labor dedicated to export-based energy monocrops come at the expense of poor rural communities, resulting in evictions, land grabs, increased prices for grains such as corn. In Honduras, conflicts over land between poor campesino farmers and members of Honduras’ oligarchy, with involvement of military and police, threaten continued violence and political instability. Over the last two years, roughly 60 land rights activists have been killed in the Aguán Valley due to conflicts with African palm oil producers Dinant and Jarimar. Thousands of rural workers occupied land in several locations last week and the conflicts threaten to escalate to violence or a wider-scale. Examples of these conflicts have been seen in Guatemala, Ecuador, Paraguay and several African countries. It would seem, despite much propaganda meant to ensure agrofuels would not impact food production nor indigenous communities and land biodiversity, the threats continue to compound. Scientists have genetically modified algae to produce oil efficiently, but significant challenges remain in the ability to break down amounts necessary to produce significant amounts for a competitive cost. Algae are tiny biological factories that use photosynthesis to transform carbon dioxide and sunlight into energy so efficiently that they can double their weight several times a day. As part of the photosynthesis process algae produce oil and can generate 15 times more oil per acre than other plants used for biofuels, such as corn and switchgrass. Algae can grow in salt water, freshwater or even contaminated water, at sea or in ponds, and on land not suitable for food production. On top of those advantages, algae — at least in theory — should grow even better when fed extra carbon dioxide (the main greenhouse gas) and organic material like sewage. 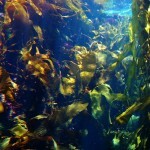 If so, algae could produce biofuel while cleaning up other problems. Algae can be grown practically anywhere, on brownfields, under-utilized or marginal lands that could even be contaminated for previous industrial processes. Hence, they would not replace food production or biodiverse ecosystems. Algae fuels would be carbon neutral, meaning it would burn carbon dioxide, but in growing it absorbs the same amount burned. It can even reduce carbon emissions depending on where it is grown. Algae fuels are biodegradable and not dangerous if spilled, and require no toxic chemistry, such as fracking natural gas or petroleum refining. It is distributive on a local level, meaning small producers could easily enter the market. Uses existing pipelines and refineries and is usable in cars, trucks and airplanes. Requires only sunlight, water (ocean or wastewater too) and CO2 to form sugars to become algae. These can be metabolized into lipids (oil). High levels of polyunsaturates in algae biodiesel would be suitable for cold climates. Burns more efficiently, better mileage. Expensive to produce with present technologies, at about $250 per barrel of oil. Some have projected a future parity of costs with fossil fuels based on price supports and scientific advancements. Limits to quantities of hybridized algae that can be broken down before it becomes toxic. Some biodiesel produced may include unstable polyunsaturates and burn less efficient. Secondary impacts to water quality and ecosystems. Could have ecosystem implications from genetically engineered microorganisms possibly escaping. Economic uncertainty to an unproven technology. More research will be forthcoming, but stay tuned. Algae Biofuels will have a future, rest assured. EPA says no palm oil from SE Asia, but what about from Hawaii where 100,000 acres of abandoned sugar cane/pineapple land is available? Suppose a sustainable group came up with a plan to develop say 3,000 acres of oil palm with coffee, cacao and other crops interplanted (food and biofuel mix) on this land and sold house lots so that 10-15 acres was taken up by 650 homes in village formats with room for individual gardens, homes to have solar panels, composting toilets and a community well to serve fresh water with gray water going to irrigation? Supposed the 3,000 acre of biofuel/food was held jointly by all homeowners who with purchase of their home also bought into an agreement to provide up to 20 hours/week of labor for the mixed biofuel/food production system? Suppose the targeted homebuyers were the retiring baby boomers who after the farm was operable might earn as much as $8,000 or more plus fresh fruit and vegetables from their shares annually, making the whole operation nearly self sustaining while supplementing their retirement? Would there be a market for this model? Comments are welcome.